What I would give to have a brain gifted enough to handle stuff like math and software coding (and I've tried folks, believe you me). 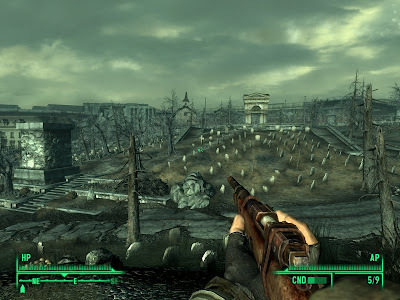 'Cuz then I could maybe work for a company like Bethesda Game Studios, who not only are very talented at making video games like Fallout 3, but also have a twisted sense of humor. Guess what? 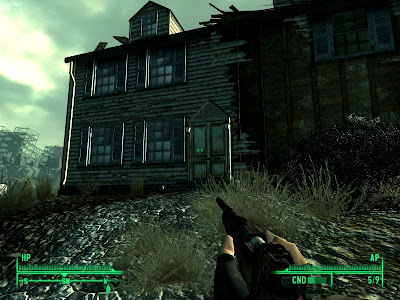 You can go inside of Arlington House in Fallout 3! There's even a queen-sized bed (presumably in the Lees' private chambers) that you can sleep in and recover from in-game injuries. 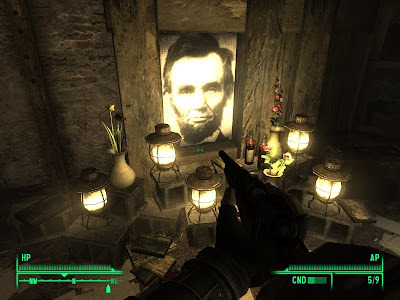 A shrine to Abraham Lincoln?!? What the heck?! You wanna work for a videogame company? Work for a one that actually has craft. Work for Obsidian Entertainment. The Sith Lords were the best thing to come out of Star Wars since The Empire Strikes Back, and Neverwinter Nights 2 - Mask of the Betrayer is the spiritual successor to Planescape: Torment, one of the finest videogame narratives of all time! "A shrine to Abraham Lincoln?!?" Could have been planted there by Union soldiers.